A sole purpose of a film is to entertain, tell a story maybe deliver a specific message which may get people talking, debating possibly trigger some form of action. Most filmmakers will deliver that entertaining story but as soon as you leave that cinema or if it’s a DVD switch off your player that 2 hours of pure escapism has been forgotten and you tread back into the real world.There are a few filmmakers out there who possess a natural talent of implanting the fabric of the film into your memory encouraging to share, debate maybe even take action and one of those is Japanese director Sion Sono. From the 2001 cult classic Suicide Club to the more recent Coldfish (2010) and now Himizu a tale of surviving but not just in the physical sense but at a natural level too. Set in a dystopian existence Himizu is the story of Sumida (Shot Sometani), school friend Keiko (Fumi Nikaido) teenagers whose parents who encourage their children to die. Sumida wants to live an ordinary life however his mother is an alcoholic, sleeps around leaving her son to fend for himself as well as run the family’s boat rental eventually leaving but eventually, she leaves altogether. 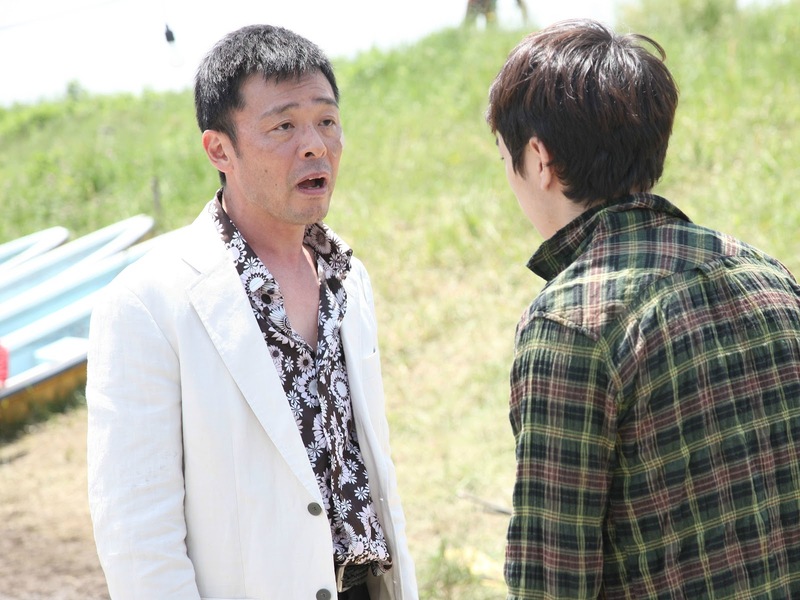 Sumida’s father penniless but most of absent from his parental duties appear in his son’s life but treat him more as a punching bag for his angst and Sumida’s dreams of an ordinary life start to evaporate in front of him. Keiko, however, is one of his schoolmates whose own dreams are fading in front of her she also has a major crush on Sumida and her presence around him seems to annoy him. Any good gestures that come Sumida’s way he seems to reject them outright and any chances of leading that ‘ordinary life’ goes out the window when tragedy overtakes when he commits a crime bring him to the edge of insanity as dreams of apocalypse haunt him. I don’t like to use swear words in reviews but our little blue planet is one fucked up place, not just by the environment but also from its inhabitants. During Himizu we do meet a diverse range of characters everything for damn right bizarre, off-kilter, proud, honourable bunch but nothing is straightforward in a Sono film. Any talk of doing anything straightforward like the talk of a straightforward adaptation of the Manga the film is based on rightly sarcastically laughed away.It was a great idea to set the film in the backdrop of the Fukushima disaster giving you the sense of conditions the characters are living under as well as giving the director an open canvas to make things more bleaker and depressing. What really makes Himizu a really unsettling film, the 2 most important people in a child’s life the parents are hateful, negligent instead of protecting their child from the horrors of everyday life. Sumida’s father is a penniless alcoholic who takes out the angst of life out on his son treating him like a punchbag wishing he was dead. His mother is no better as she spends most time sleeping around, drinking leaving Sumida to fend for himself before leaving him for good by leaving him with her latest boyfriend. It asks the question was Sumida’s father just another one of his mothers’ boyfriends or were they the perfect couple whose life changed when their son was born? Whatever one it is he’s that little accident they regretted. Sumida just wants to be normal but with the parents, he’s got he’s never had that chance to even attempt to make his life better and you really understand why his life is falling apart with no role model or direction. However, Keiko and the refugees living in the makeshift homes outside the boat rental provide Sumida with some ray of light, hope. Keiko may introduce herself as his ‘stalker’ as she loves him she is uncanny, gallant girl but means well especially as her optimism on life is a lot stronger despite having similar parental troubles. The refugees really make optimism for life more stronger as they have lost everything but instead of approaching each day as a struggle they approach it with determination. The vagabond life they lead does in a way reflect the struggles many families live around the world face every day thanks to the world’s economic crisis.The young can’t get work thanks to the mistakes made by those they trusted to give them a good start in life so though the refugees may show there happy they feel dishonoured at those mistakes and will do anything to appease those mistakes.One of the older characters hooks up with a local pickpocket resulting in killing a nuke-loving nazi. He did it to help Sumida get the money for Yakuza for the gambling debts his father made and when he finds out the refugee is so ashamed. The streets do also seem to be full of knife yielding angry young men terrorising all who walk the streets, the anger, the disillusionment the disconnection from society is a feeling that’s felt with the young worldwide. Sion Sono is the master Nihilist and Himizu is probably his least nihilistic to date. The film is violent but violence with a purpose with a big slice of black comedy but not in a way it spoils the films.Himizu might not be the total package, I had to watch the film twice to really appreciate the ingenious work Sono has created, well-crafted work proves he is the master at the destruction of the human soul to the brink of insanity. What we mustn’t forget is for life to get better sometimes it has to scrape the bottom of the barrel before it must get better and never give hope.